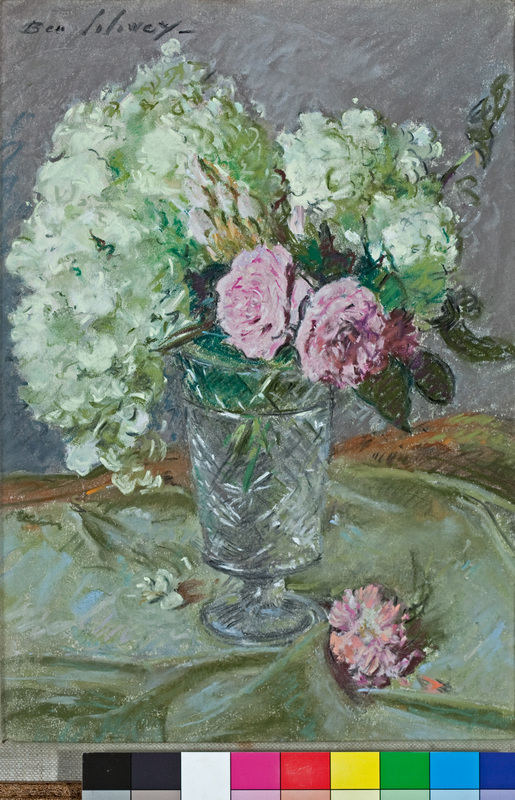 paintings, drawings, and prints of lush floral arrangements, intimate studio compositions, and works that include Ben Solowey’s favorite subject, his wife Rae. “Ben Solowey drew on the genre of still lifes in which he intertwined both the classic and the modern to create a signature style that won many awards and was a favorite among collectors,” says David Leopold, Director of the Solowey Studio. Still Lifes by Ben Solowey will open to the public on Saturday June 7th at the Solowey Studio in Bedminster, PA with a reception from 1 p.m. to 5 p.m. The exhibit will continue Saturdays and Sundays, 1 p.m. to 5 p.m., through June 22nd and then by appointment through August. Still Lifes by Ben Solowey features the wide range of media that Ben Solowey mastered over his sixty year career including oil paintings, watercolors, drawings, and etchings. 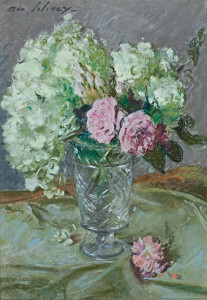 “Some of the earliest works we have of Ben’s are still lifes,” says Leopold. “When he finished at the Pennsylvania Academy of Fine Art, he supported himself by re-creating Old Master still lifes and game paintings. These dark -hued works were in stark contrast to the still lifes he painted for himself which frequently included bold, vivid colors that reflect the influences of teachers, Arthur B. Carles and Hugh Breckenridge. Visiting Still Lifes by Ben Solowey, “there is the thrill of seeing these masterpieces where they were created, in Solowey’s spacious studio,” exclaims Leopold, “which maintains the atmosphere of the artist at work.” The inviting studio, and the beautiful property it sits on, were created and landscaped by Solowey after he left New York in 1942. The Studio has been featured in Architectural Digest, Pennsylvania Heritage, The Discerning Traveler, and Bucks County Town and Country Living. Regular admission to Still Lifes by Ben Solowey is $5. Hours are Saturdays and Sundays, 1 p.m. to 5 p.m. through June 22nd, and by appointment through August. The Studio of Ben Solowey is located at 3551 Olde Bedminster Road in Bedminster, Bucks County, Pennsylvania. For more information on Still Lifes by Ben Solowey or directions, contact The Studio of Ben Solowey at 215-795-0228, or via www.solowey.com. we are looking forward to visiting the studio and home again. The still life paintings and drawings are brilliant – truly a joy to behold. Can’t wait!